In this video, Andrew Edelsten, a Deep Learning Engineering Director at NVIDIA, details the three most important things developers need to know about DLSS. 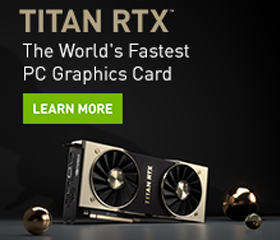 For instance, when we look at the next-gen visuals in 3D Mark’s “Port Royal”, we can see that even NVIDIA RTX GPUs with their RT Cores can struggle with the benchmark’s extreme content. By enabling DLSS, which leverages Turing’s Tensor Cores, we have a much higher and more consistent frame rate. The NVIDIA Research team invented DLSS, but adding it to a game required extreme optimization of the model and experimenting with different layer types, input sizes, and training techniques. Going from research to production was a big step, during which we learned a ton and added layers of automation to our Saturn 5 Supercomputing Cluster. It’s going to be awesome! So start thinking today about how you’ll use deep learning in your next game! If you’re attending GDC 2019, come and learn more about DLSS, how DLSS was integrated into Battlefield V, and Deep Learning for games and graphics, during the session listed at the top.